Well that’s it. Meteorologically speaking Summer is over. We’ve had a few decent days but no heatwave and no prolonged summery spell. We managed a high of 29.7°C on the 19th of July and 240mm of rain over the three summer months. As usual, don’t rule out a week of decent weather in September or even an Indian Summer late-September as it always seems to be the case. I’m just finishing my holiday in Cornwall, waiting for this morning’s rain and cloud to clear before we hit the beach for one final time. What a lovely place this part of the World is. 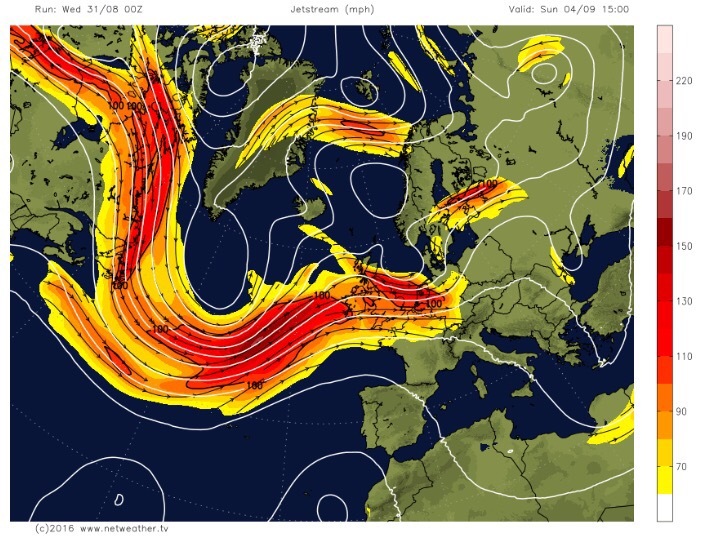 An active Jet Stream taking control this weekend and beyond? Next week: Things are uncertain. 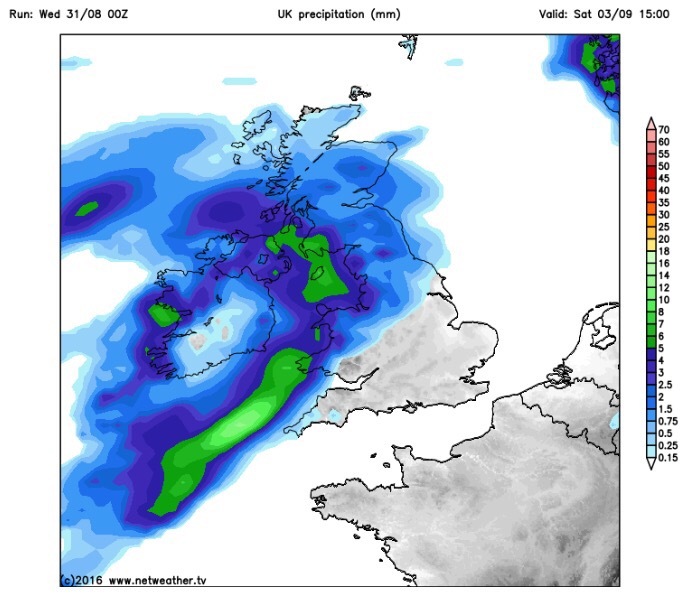 Quite an active Jet Stream means the likely situation is spells of rain with drier interludes. Of course, frequent updates on Twitter. Follow @ChadWeather on Twitter for all your local weather updates for Manchester and its surrounding areas. It’s weekly blog time. Just a short one this week as I’m off on my travels for a week’s holiday in Cornwall. 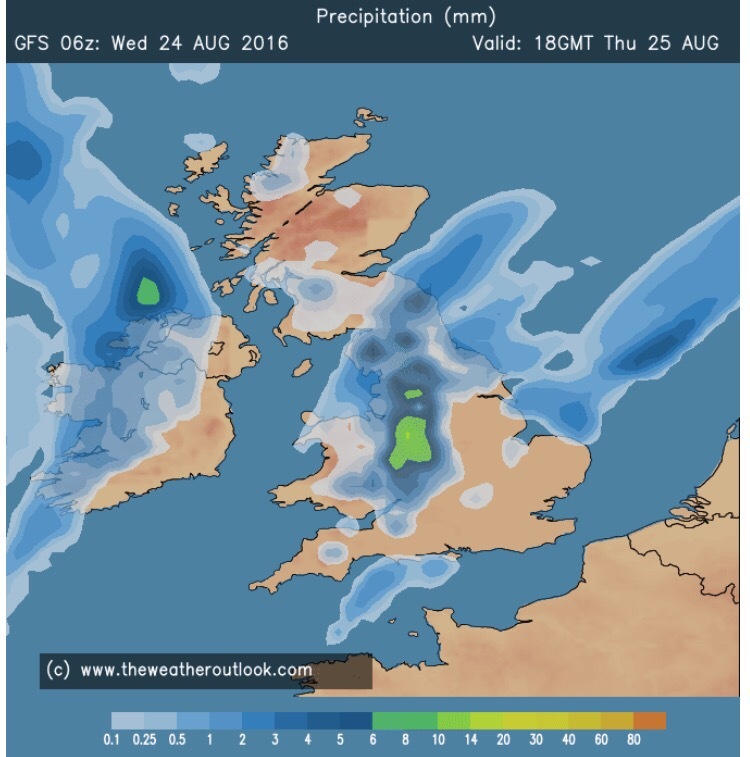 Fingers crossed we get a good few days out of our “British Summer”. This time last week August was looking a dry month with only 18mm of rainfall. Now we’re up to 70mm after a few days of heavy downpours. The south-east has enjoyed “heatwave-like” temperatures but officially no heatwave has arrived despite what the media say. Plenty of uncertainty this weekend as low pressure comes up from the south. Its development and where the rain falls is still open to change. Beyond that there are signs the Jet Stream will kick in so bright spells in between spells of rain is the most likely scenario. I hope you’ve all been enjoying the lovely summery weather we’ve been experiencing this week. If you haven’t had chance to and you’re pinning your hopes on this weekend, you’re going to be disappointed. For me this week has been perfect. Early 20s and no humidity to spoil it. We will sneak in another day before it’s all change. Next week: Starting off a little more settled before showers return. A small chance of it warming up in the south but no heatwave in sight. If you’ve been keeping up to date with my tweets recently, you will notice that we have some warmer, possibly hot, weather on the way. This is still the case, but the length of the heat and how hot it becomes is fluctuating daily. The usual media bull is out there again saying it will last 2 weeks. At the time of writing this blog, it’s more like 2-3 days. So ignore their lies. Thursday: Cloudy with some rain during the morning. Hopefully, bar some hill-drizzle, all of the rain should ease away into the afternoon but it will still remain cool and cloudy. Max 17°C. Friday: Bright spells and some thicker cloud at times which could produce some showers, especially in northern parts. Windy at times and temperatures improving. Max 19°C. The weekend doesn’t look too bad. Sunday the best day I reckon. Saturday: A mainly cloudy morning which could see some light rain or drizzle. Drier with bright spells into the afternoon and with lighter winds feeling pleasant. Max 18°C. Sunday: Becoming warmer with sunny spells developing. Max 21°C. Next week sees it become very warm or even hot into Monday/Tuesday but it will only last two or three days. We will have sunny spells but it will be muggy and we could see temperatures peaking at 27°C, before it turns cooler from midweek, with maybe a thundery breakdown. I have been tweeting about this possible heat next week and will continue to do so. There is still a chance this doesn’t happen at all [or even be slightly hotter and last longer] and I’ll be keeping you updated on Twitter, @ChadWeather. Follow @ChadWeather on Twitter for all your local weather updates, especially for Manchester and its surroundings areas. WOW! It’s August already. Where is this year going? Even one high street retailer has started the Christmas ball rolling this week; just crazy! As for our summer, it’s taking its usual path but what next as the media yet again publish made-up, guesswork nonsense about a ‘MONSTER HEATWAVE to last until September’. 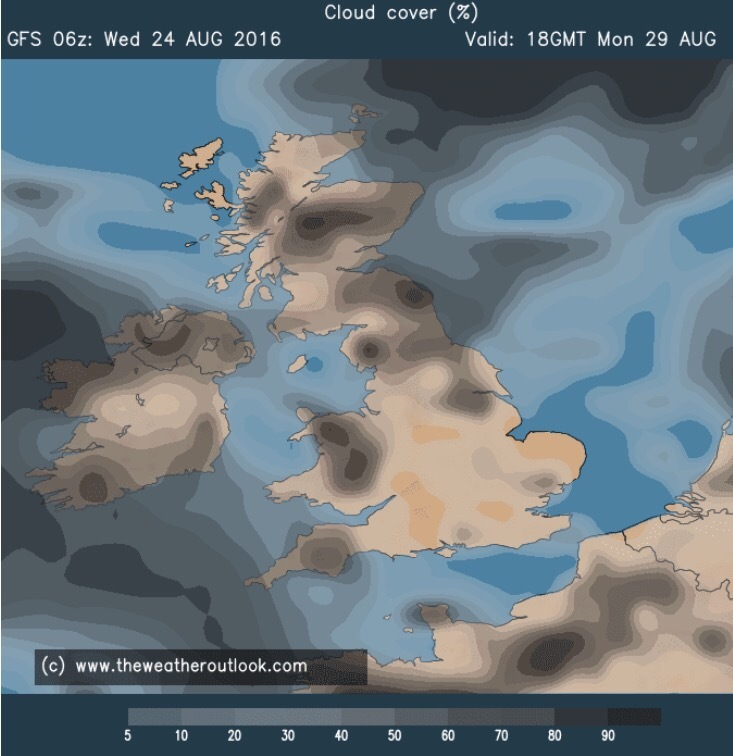 Thursday: Cooler with a northwesterly wind bringing some hefty showers to the region, some could be thundery. Drier into the afternoon. Temperatures down on recent days. Breezy. Max 18°C. Friday: The low pressure that’s been around most of the week has slipped into the North Sea, so any showers should start to ease away and become confined to eastern areas. Bright spells developing from the west. Max 19°C. With low pressure arriving to the northwest and high pressure building to the south, we are sandwiched in between this weekend. However, with a southwesterly airflow, temperatures will start to recover. Saturday: Quite a lot of cloud over the region but some bright spells are likely, which will lift the temperatures and make it feel warm. A risk of some rain from the southwest into the afternoon or evening. Breezy. Max 22°C. Sunday: It should be less windy as high pressure nudges up from the south. Any early rain should clear to leave a day of bright spells and generally drier. Not as warm as Saturday. Max 20°C. After a settled start to next week, it looks likely to turn cooler and unsettled with temperatures below normal. Later in the week, we could even have a northerly airflow across the UK. There is zero sign of a MONSTER HEATWAVE. Those media clowns start spouting off when the temperatures gets into the mid 20s down south, usually the southeast, and yes this is likely for a few days, but it will not be prolonged, and it will certain not be a monster. They print nothing but made-up stories to sell papers and get you, the public, clicking on their links. Don’t do it.